This is a rather close fit, as it was designed to be. In fact, it’s a little closer that I am used to, although my husband endorses it wholeheartedly (no ulterior motives there, eh?). He is of the opinion that I wear my clothes too baggy. What do you guys think? The only change I will probably make is to adjust the neckline. It’s choking me! I adapted the pattern from a boatneck to a crewneck and should have gone lower an inch or two. When I picked up for the rolled edge, I picked up 3/4. I think I will frog that and pick up 1/1 and just do a backward crochet edge (one of my favorites). That should make it a little stretchier and a tad lower. I didn’t mention the yarn I used – it’s Louet Gems Merino and I love, love, love it! It’s soft against the skin and has a lovely finish. It is a DK weight. I just can’t say enough about how much fun Elsbeth Lavold’s patterns are! They are a challenge and you have to read very, very carefully, but once again I feel as if I have created magic. I have a feeling knitting Rogue is going to give me that same feeling. It turned out beautiful!! Even though you don’t like the neckline, it looks great. Beautiful sweater! I love the details and the colour. I think it fits you well too. That is simply beautiful…and quite smashing on you! Nice work! I think it is just lovely! I love the way the diamond patterns form a narrowing look through the torso. Very flattering.My husband is the same way. Of course, my first sweater was the “big sack” which he’d rather see my son wear! The fit is perfect and the shape and color look great on you. No wonder your husband loves it. Too bad the neck doesn’t feel comfortable because it looks great in the picture. I’m sure it will look just as nice when after you modify it. I lean toward the baggy, cover-up-all-sins kind of silouette myself. If I thought my rear view would be as nicely curvaceous, I’d consider being a bit more snug myself. The sweater, AND THE MODEL, look beautiful. Lovely sweater and you look very good in that colour! Beautiful – both the sweater and you! I have to add to the praise. It looks gorgeous on you. 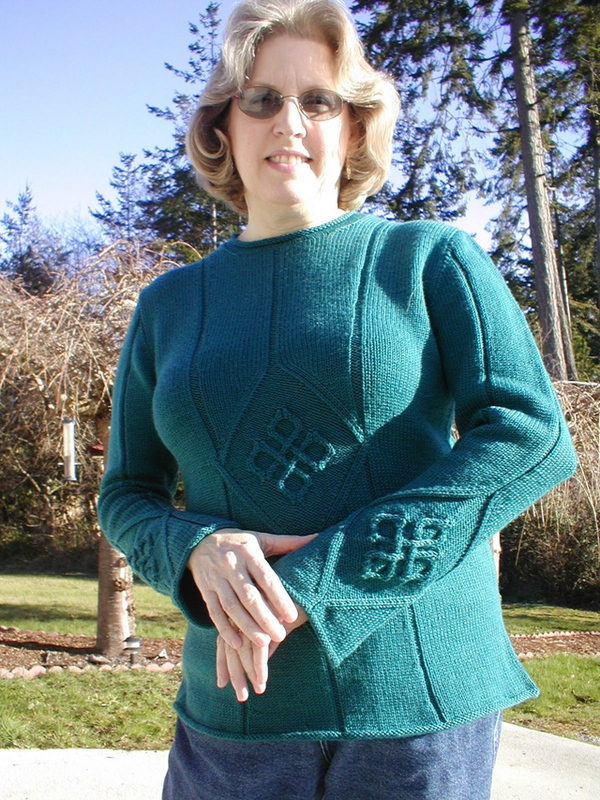 The diamond pattern in the center does give it a lovely shape and I love the shape of the sleeves as well. Please don’t put it away but wear it as often as you can. Dorothy…all I can say is OUTSTANDING!!!! It’s gorgeous and fits you perfectly. And yes…I love the fitted! I agree woth your DH. First, I am sorry about your family’s loss. Don’t you think it is hard to have those conflicting feelings, sadness at the loss of a loved one, but relief for the end of their pain and suffering? I have felt it in the past. Anyway-this sweater looks awesome on you. I agree with your husband, it fits you perfectly and the baggy thing is so not in (my kids remind me constantly). Congratulations! Hi, I love your sweater. 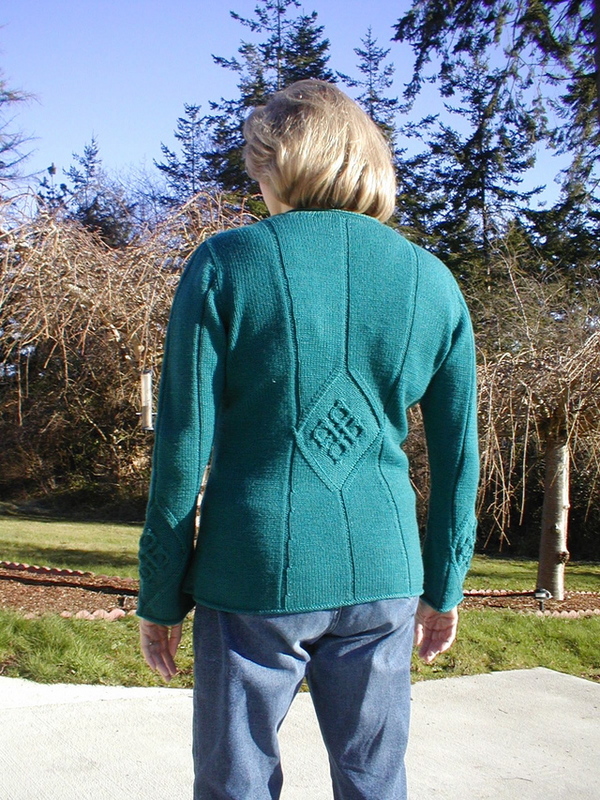 I’m prepping to make the same sweater and I wondered if maybe you could explain to me what you did for the collar? I like the look of the crew neck better than the boat neck in the instructions. Thanks!